Starting today Best Buy is discounting the 20GB Xbox 360. The console is now on sale for $299, $50 less than it’s previous retail price of $349. The big box retailer is also offering a high-definition gaming bundle for $749 which saves you $200. 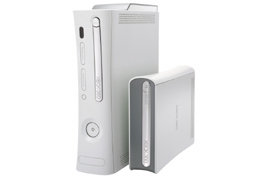 The bundle HD gaming package includes a Westinghouse 26″ LCD HDTV (normally $549), Microsoft’s 20GB Xbox 360 gaming system (now $299), and a special Guitar Hero III with wireless Gibson Les Paul guitar controller ($99). These items add up to $949 but the $200 brings it down to $749.